Anxious? Afraid? Let's do it anyway! Happy 2018: 365 days of Happy! Happy 2018 – Day 307 – Try new things this November! 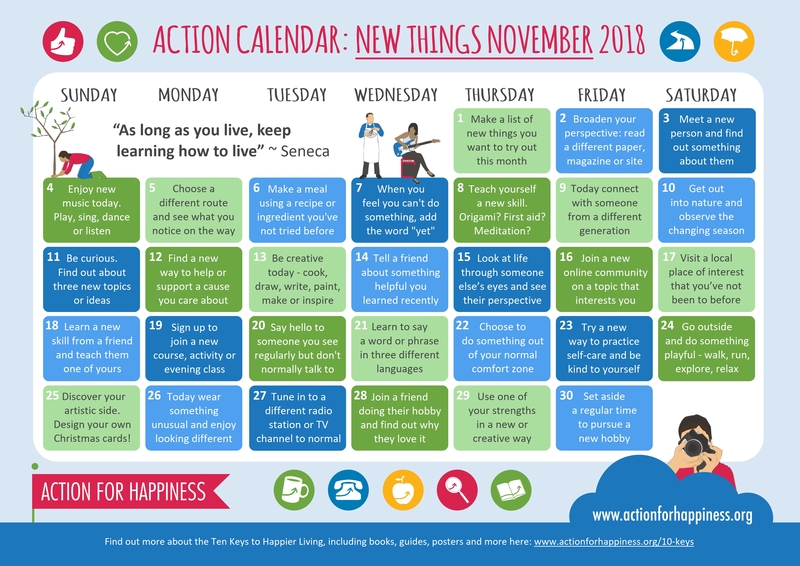 Action for Happiness have done it again, this month with a ‘New Things November’ calendar! Click here for a PDF of the calendar. Only days ago, I wrote about ‘keeping your scares simple’; that if you try new things, big, small or tiny, every day, then you really can do at least one thing each day that scares you. So when I saw that this months’ calendar was based on the same theme, I had to share! Because when you step out of your comfort zone into your challenge zone every day, you rapidly widen the limits of what you’re comfortable with. There’s some great simple ideas in this calendar; ideas that will enable you to try new things and mix some variety into your life, without any grand gestures, buckets of cash or extra days in the week. When you make fear your Counselor, rather than a jailer, you unlock the cage of your own potential… and you’ll amaze yourself at what you can achieve. Next Happy 2018 – Day 308 – Don’t be afraid to turn things upside down!